What is Amber? What is it made of? Where is it found? (Note: These results were found using a keyword search, and so may include any type of items that include this phrase in the description. Please check each product description/website for details of exactly what is being offered by the vendor). HANDMADE DESIGN - each pair of earrings is handcrafted from natural amber pieces, giving them a delicate rose shape. Theres always a slight difference in each pair which gives a completely unique look. COMFORTABLE TO WEAR - the earrings are very light and comfy. Each rose diameter is approximately 0.39 / 10 mm, it won't weigh down the ears. GIFT-READY - the pair of amber rose earrings comes in a little gift box. It's ready to be given as a beautiful gift for your beloved one! Amber rose earrings are the perfect match for formal occasions or everyday wear. 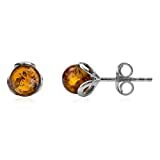 Baltic amber stud earrings Rose are made of genuine natural Baltic amber and combined with sterling silver posts. Each earring is formed raw amber stone into rose shape and polished to make it shiny. Please note that amber earrings are not machine made, each pair is handcrafted. There is always a slight difference in each pair. 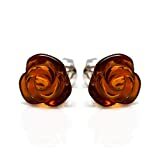 Amber studs are very comfortable to wear. Extremely light earrings won't weigh down the ears. Each earring comes with butterfly back, which holds firmly and assures the earrings won't be lost. The rose earrings comes in a little gift box. It could be a perfect gift choice for Mothers Day, Birthday, Valentines Day, Anniversary or any other occasion. The amber earrings are the perfect match for formal occasions or everyday wear. 100% GUARANTEE that we use only genuine Baltic amber. It's not pressed or modified in any other way. 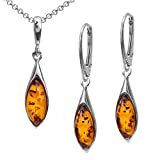 Baltic amber earrings don't require a special care. Please avoid contacting them with extremely hot surfaces. If the silver posts gets tarnished gently rub it with a cloth. We offer fast Amazon prime delivery. 30 days return policy guaranteed. 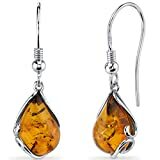 Sterling Silver and Baltic Honey Amber Earrings"Lauren"
Earrings Total Length: 1.3"; Total Weight: 2.92 g.
We only use sterling silver for our earrings. Each earring stamped with "925" that ensures 92.5% of silver. 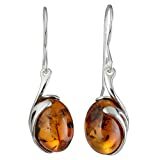 These elegant one of a kind sterling silver honey Baltic amber earrings can be worn for any occasion. 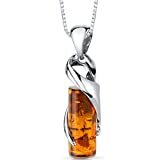 It is believed that amber brings luck and protection to people and it has been a symbol of love, marriage and eternal freedom. Since amber is a natural stone, its shape and size may vary slightly. Handcrafted in Europe. Earrings come in a gift box. 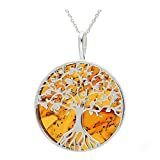 Wear amber and feel the energy of this "beaming sun"! 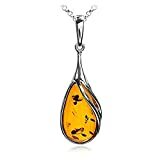 Genuine Baltic Amber Necklace. CERTIFICATE OF AUTHENTICITY certificate number # 4207115651 USA International Gemological Institute . Sterling Silver 925. Honey Color Amber. 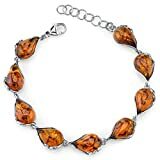 Amber is the lightest and warmest stone that exists, which makes it the most comfortable and attractive gem in jewelry. Best for: Holiday season Birthday gift Valentines Day Present Mother's day. Perfect gift idea. Lightweight gem. Amber is very comfortable to wear. Jewelry Gift box included. Certifit genuine Amber. Sterling Silver 925. Small stud earrings. Gift idea. Note: Our company and this web site does NOT sell jewelry or gems. 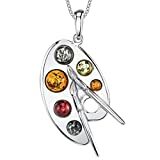 Any and all jewelry or gems that may appear on, or be linked from, this website, is an advertisement for a product sold by a third party. Please be sure to read product descriptions carefully, and do appropriate research and due diligence before purchasing jewelry or gems or other products. Sorry, we are NOT able to answer questions about jewelry or gems or third party products/websites.